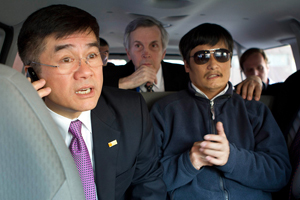 Chen Guangcheng arrives at the New York University Village apartment complex in Manhattan in New York, May 19, 2012. The arrival of the celebrated Chinese rights activist, Chen Guangcheng in the U.S. after years of prison and house arrest, raises the larger question of what the whole incident will come to mean in terms of the status of dissidents in China and in U.S.-China relations. In the years immediately following its suppression of pro-democracy demonstrations in 1989, the Chinese government often did respond to pressure from Western governments by reluctantly releasing a jailed dissident or two before critical events when it felt the country had something at stake. But, the experience of feeling compelled to yield to Western demands—never mind how just they were—was still one fraught with such historical sensitivity, that it was agonizingly painful for Beijing to do so. High officials continued to give in only because yielding to U.S. or European demands did help smooth the way towards getting something else that they wanted or needed, such as an important summit meeting between presidents, prime ministers or foreign secretaries or attaining some other long-sought goal like the rights to hold an Olympic Games. But, as China’s rise continued to bolster its clout in the world, the Chinese Government soon became far more resistant to such foreign pressure. At the same time, another quite counter-intuitive revelation seemed to dawn on Chinese leaders. Just as they were becoming more resistant to pressure, they also seemed to conclude that in certain instances, it was probably better to just exile dissidents and get-them-off-the-lot, so to speak, so that they would not continue to be an endless source of damaging international criticism and bad publicity. They seemed to pragmatically conclude that the cost/benefit ratio of yielding to outside pressure and removing the source of the irritation and contention was actually pretty favorable to them. The risk, or cost, was a week or so of intensely bad press for China as the dissident landed abroad and was engulfed in a media frenzy. Then, the issue might surface again for a brief reprise when a book or documentary film came out later. But, such second acts would usually echo harmlessly like the report of a far-away howitzer that is heard faintly, and then only after the puff of smoke from its muzzle-burst has long-since vanished. The benefit to Beijing was that after a short period of unwelcome coverage about China’s intolerant and oppressive policies towards critics, the press would lose interest, the world would go about its affairs and the dissident would become submerged in the process of building a new life, learning a new language and making a living in his new home. In the meanwhile, China’s security establishment could maintain tight controls on other less well-known dissenters. The tactic of facilitating the most prominent critics of the Party to go into exile was something like the outsourcing of the manufacture process of a very polluting and unwelcomed home-based industry. There might initially be some complaints from dispossessed workers, but ultimately all, or almost all, would be forgotten, and the ongoing problem, if there were one, would be someone else’s. 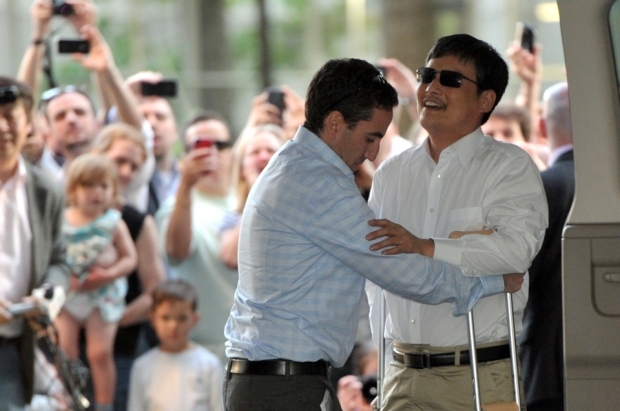 Chinese dissident Chen Guangcheng looks on as U.S. Ambassador to China Gary Locke talks on the phone May 2, 2012 in Beijing, China. During Chen Guangcheng’s stay in the U.S. Embassy earlier this month, I happened to be in Beijing attending the most recent session of the Strategic & Economic Dialogue that the U.S. and China hold twice a year as a way to deal with the broad array of problems which vex the bi-lateral relationship. While inside the containment vessel of the U.S. Embassy, the core of the S&ED process was near radioactive meltdown as both sides —including Secretary of State Clinton, Ambassador Gary Locke, Assistant Secretaries of State Kurt Campbell, State Department legal advisor Harold Koh, and Assistant Secretary of State for Democracy, Human Rights and Labor, Michael Posner —slugged it out with Chinese Ministry of Foreign Affairs officials on how to deal with Chen’s sudden escape and flight into the hands of U.S. diplomats, the rest of the S&ED went merrily along. All around the city different groups were discussing such issues as currency exchange, how to deal with the DPRK, climate change, the Taiwan problem, military-to-military relations, and what forms of cultural exchanges might best fortify relations between the two countries, as if there were not a crisis in this other parallel universe. This strange alternative universe of constructive dialogue that continued undisturbed was actually very telling. What it suggested was that early on, the Chinese government seemed to have decided that, this time at least, it would not use one sensitive issue to hold the rest of the U.S.-China relationship hostage. In this, China showed either a new maturity, or a much keener sense of realism, perhaps recognizing that relations with the U.S. are even more important than the fate of a single dissident, even if his flight is represents a sublime loss of face. Moreover, despite some temper flare-ups and few moments of impatience, one would have to say that both sides evinced a new and welcome maturity in their negotiations. By all accounts, they both ended up handling the whole crisis in an admirably professional and constructive way. It was, no doubt, not easy for the Chinese to yield as they finally did, especially in the glare of so much publicity. But, yield they did, and, to its credit, the U.S. side did not seek to unduly impugn China. Indeed, it acknowledged the constructive way in which its diplomats had worked toward a common goal, and with a minimum of official rhetorical bravado. In the end, the Chinese government gave Chen and his family passports as promised, the U.S. kept relatively quiet, and, lo and behold, this Saturday evening Chen and his family finally stepped off a plane at Newark’s Liberty Airport. In many ways, it is tempting to look back at the whole transaction as something of a hopeful breakthrough. With a minimum of posturing, the two countries did manage to work their way through a very difficult problem. Evidently, each saw sufficient common interest to find a mutually agreeable solution. That is a very hopeful sign. Has anything really changed? It’s not yet clear. But, it is important to remember that Beijing has not declared Chen a criminal. Chen himself, in his first statement to the media after arriving in New York, thanked China’s leaders for handling his case with “calm and restraint.” If Beijing continues in this vein, one hopes, going forward, it can treat him not as an enemy of the state, but as just another student going abroad to study, albeit, under some pretty strange and trying circumstances. What is more, such a magnanimous declaration would send a stunning signal to both Washington and the world, that China is becoming more confident, flexible and able to see those areas where its interests overlap with those of other countries, even those with very different political systems. It would also suggest that, at last, China has begun to understand that “soft power” is not simply about PR, but is also about governmental deportment. I hope this will turn out to be the case, and will reserve final judgment in hopes that such a statement may soon be proffered by Beijing. In the meanwhile, I welcome Chen Guangcheng and his family to America and hope that he not only fares well, but that his voice will not soon be forgotten.